Graphite Shaft - Aldila Tour Green - Stiff Flex. (drivers, fairway woods, hybrids, single irons, wedges, putters. 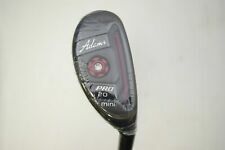 Adams Pro Mini 20 3 Hybrid. Right Handed. ). O-Works Red Jailbird Mini S. Fairway Woods. 2nd Swing Minnetonka is 1 of only 3 Studio B Fitting Studios in the country. 72 P.S. Â§ 7213.2. Shaft Flex. Shaft Type. Shaft Notes. We do provide images of the actual shaft for all of our golf clubs to help better identify the exact shaft in the clubs. Grip - Original Odyssey Leather Stitchback. This putter is in nice condition with only light brush marks to the sole. The face and top line are in excellent shape without any nicks or dings. Shaft - Original Odyssey Steel. Taylormade Spider Mini Silver Black Steel 34" Superstroke GTR RH. SuperStroke Pistol GTR 1.0 Grip. Black Steel Shaft. Shaft: Matrix Ozik Program 55 (light weight shaft). Up for Sale is a New Adams Pro Mini Hybrid. (Adams is part of TaylorMade Golf). Model: Pro Mini Hybrid. High toe profile head. Head cover: Sorry, NOT included. Shaft: TP Aldila RIP 85. Up for Sale is a New TP Adams Pro Mini Hybrid. - Developed for TaylorMade TP Rescue hybrid. (Adams is part of TaylorMade Golf). Model: Pro Mini Hybrid. High toe profile head. Head cover: Sorry, NOT included. Used RH Odyssey O-Works Jailbird Mini Black 34” Putter. Condition is Used. Shipped with USPS Priority Mail. Comes with head-cover. This putter has been played with great frequency. Value Condition Putter Example Video. Value Condition Putter Example. The PVD process increases wear resistance for incredible durability. We realize that mistakes do occur. Club Type: Driver Gender: Shaft Info: SPEEDER 57 Lie Angle Dexterity: Right-Handed Shaft Material: GRAPHITE Loft: 14 Club Condition: Par. We take actual images of the item you are buying! 2 Eagle: Excellent condition. Cette pitchfork dispose d'un Switchblade. 1 x Golf Green Divot Repair Switchblade outil. Golf Iron & Wedge Clubs Outil de ré. 2pcs Outil Pour Installation Poigné. Accessoire Golf Club Installation Po. Refined Spider Design. Pure Roll Insert. All goods remain the property of HOTGOLF LTD until paid for in full. This fee will depend on the size of the order and will be quoted should you wish to cancel the order. The XV Thriver Mini is a whole new classification of head. Not exactly a driver head and not exactly a 3 wood, but can be used to replace either! Even more importantly, the thinner, hotter, "high C.O.R." titanium face will help give you more distance. WHITE HOT Putter. Super Stroke Grip. White Hot Pro Mini D.A.R.T. New condition (see Grading Definition below ). If we have incorrectly listed the item or sent you the wrong item we will take responsibility for correcting the problem. MacGregor V FOIL GT Mini blanchi Bobby Grace Putter 34.75"
MacGregor V-Foil GT Mini Milled putter in used condition. Designed by Bobby Grace. 34.75" length. Original steel splined putter shaft in good condition, no label. Lamkin Crossline putter grip in usable condition. No headcover. All pictures are of the actual club for sale. The PXG Mini Gunboat - Black provides the stability of a mallet-style putter with the versatility of a smaller profile. This putter will have a dark finish. This putter has been played with great frequency. RARE THE PUTTERMAN TIM JANIGA PM-1.3 MINI BEND 303 STAINLESS PUTTER STEEL RH 33"
Nouvelle odyssée O-Works Jailbird rouge Mini Putter 2018 - choisissez la longueur. Ce putter ne dispose pas de l’arbre noir. Club Type Putter. Model Red Jailbird Mini. Dexterity Right-Handed. Toutes les images & contenu © 2013 Maple Hill Golf. WHITE HOT Putter. Super Stroke Grip. White Hot Pro Mini D.A.R.T. Black Shaft. New condition (see Grading Definition below ). If we have incorrectly listed the item or sent you the wrong item we will take responsibility for correcting the problem. BOBBY GRACE MACGREGOR V FOIL MILLED GT MINI PUTTER RH 35"
WINN PUTTER GRIP IN VERY POOR CONDITION. NO HEAD COVER. STEEL SHAFT WITH SHAFT BAND. TaylorMade SLDR Mini Driver 14 TM Fujikura Speeder 57 Graphite Regular Left Handed 43.25 in. TM Fujikura Speeder 57. Fairway Woods. 2011, 2012, 2013, and 2014 Taylormade Fitter of the Year - Minnesota. Graphite Shaft - Aldila Tour Green - Regular Flex. (drivers, fairway woods, hybrids, single irons, wedges, putters. Adams Pro Mini 18 2 Hybrid. LEFT Handed. ). Taylormade Spider Tour Mini Very Rare Slant Neck. 34 inch. Hard to come by. Mint condition. MINI JAILBIRD RED 34" MINT. HC INCLUDED. This putter is a smaller version (head size) of the White Hot XG Marxman. Thisis a toe-balanced putter with about 30° of toe-hang from Face-Balance. If you like it, don't wait! Actual Item Pictured. TYPE:JAILBIRD MINI. STYLE:FACE BALANCED. MODEL:O-WORKS BLACK. GRIP:8/ 1 0. HEAD:8/ 10. Cette pitchfork dispose d'un Switchblade. 1 x Golf Green Divot Repair Switchblade outil. Set de 12pcs Balle de Golf Perforée. 2x Outil Affuteur Nettoyeur Accessoi. Outil d'installation Ultimate Grip d.
Odyssey O-Works Putter Red Jailbird MINI S Longueur: 35" RH nouveauté! Haube: Original Odyssey O-Works. Odyssey O-WORKS Putter Jailbird Mini S. von reibungslosem und präzisem Rollen. MICROHINGE-TECHNOLOGIE FÜR REIBUNGSLOSES ROLLEN. Aufprall ein Vorwärtsrollen zu erzeugen und damit reibungsloses Rollen. For sale a good condition SeeMore Mini Giant Putter. This is a highly ranked in testing centre shaft blade putter. I bought it second hand and there are a few marks on the toe which you can see in the photos. Golfset / Bürogolf / Kindergolf / Beachgolf. Verschluckbare Kleinteile! Indoor und Outdoor geeignet. 4-teilig (3 Bälle, 1 Schläger). ODYSSEY O WORKS RED JAILBIRD MINI PUTTER. GRIP: FACTORY WINN ODYSSEY. National Golf is an authorized Odyssey Golf Dealer. SHAFT: FACTORY STEEL SHAFT. 6: MORE VISIBLE AND OVERALL WEAR. STILL HAS DECENT AMOUNT OF USAGE LEFT IN IT. Taylormade Spider Mini Putter. Length: 35". 10 Stück Kinderschläger 80cm Länge in der Farbe blau. Sie erhalten hier 10 Kinderschläger von 80cm Länge in der Farbe blau. Schlägerstiel: Aluminium - Griff: Gummi - Schlägerkopf: PVC. Adams Pro Mini 3-Hybrid & 4-Hybrid Set THESE CLUBS ARE LEFT-HANDED . This set includes a 20 Pro Mini 3-Hybrid and a 23 Pro Mini 4-Hybrid! Lofts - 20 (3H) - 23 (4H). Flex - Regular Flex. Length - Standard.